A hundred years ago, it is said that Insa-dong was full of stores providing high quality wares for the palace. Modern day Insa-dong is made up of antique stores, used bookstores, hand made craft stores, and traditional teahouses. In carefree disregard of the high-rise buildings in its backdrop, the stores here are usually one-story buildings that have maintained the atmosphere of the past. Here, in the myriad of fine craft stores that line both sides of the street, you can find anything from a simple hanbok (traditional Korean clothing), key chains costing only 1,000 won to beautiful Goryeo era vases. All sorts of items representative of traditional Korea, small and large, are gathered here. Recently there has also been an influx of items that have dominated an era yet can't entirely be considered Korean, as well as foreign peddlers selling items from various countries around the world. Insa-dong can now be considered a giant flea market. 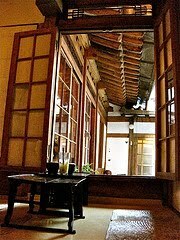 And more..
After a long day strolling about town, nothing is as rejuvenating as sipping a cup of Korean tea in a traditional Korean teahouse, or chatjip. These enchanting places are a wonderful medley of tastes, aromas and sounds, brought together in a warm and quintessentially Korean setting. Go with a friend and share an intimate conversation over tea and Korean snacks, or go by yourself to relax and soak in the atmosphere. The charming Insa-dong neighborhood, with its plethora of galleries and antique dealers and craft shops, is home to many Korean traditional teahouses, each one unique in its own way.